College Accommodations: What are My Child’s Rights? 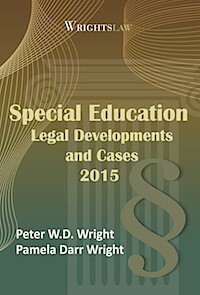 Where can I find out my daughter’s rights to accommodations in college? We asked for testing to be done out of the classroom in a quiet location. All of her tests in high school were done this way. 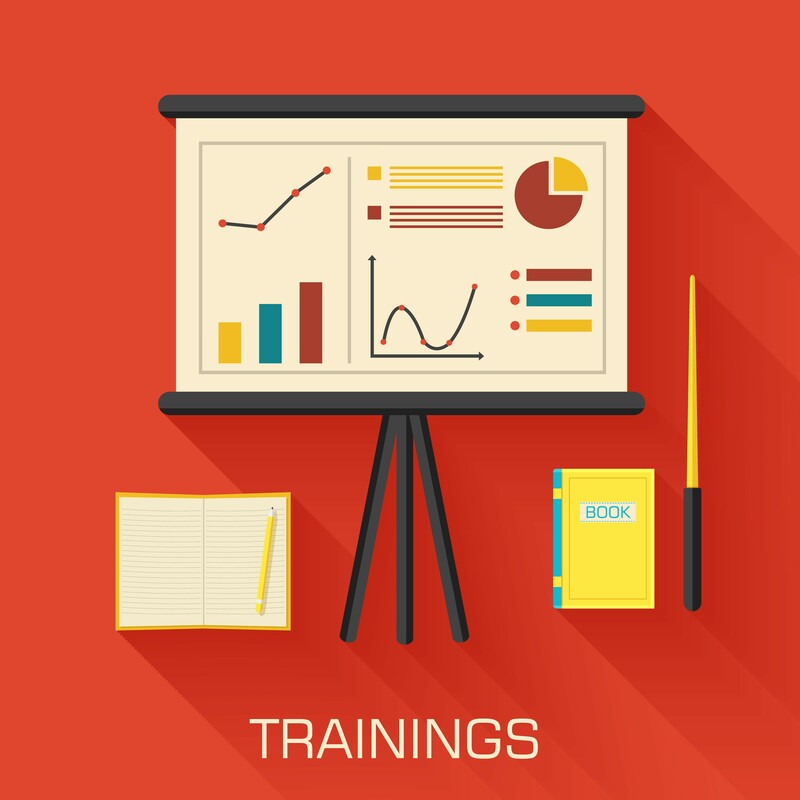 We also asked for copies of notes, PowerPoint slides, and teacher outlines to help her follow lectures. These were all denied. 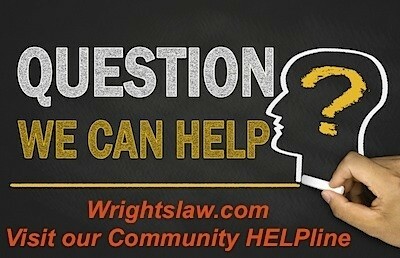 We have a section about college issues and problems on the Wrightslaw College: Continuing and Higher Education page at https://www.wrightslaw.com/info/college.index.htm. Start with these two free publications. 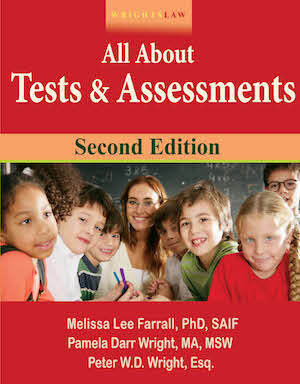 This resource book is designed to help you plan ahead – with your child and your child’s teachers and counselors – to ensure she is prepared academically for the rigors of college and to save now and plan financially for the costs of a college education. Parents of kids with disabilities are often surprised to learn that their college-bound children are no longer eligible for IDEA services. 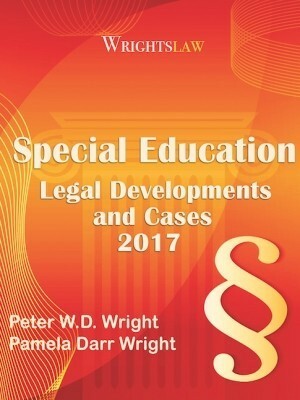 This document from Wrightslaw contains information and many resources that will help you along the way. After you read the information and articles, you’ll know your daughter’s rights and responsibilities under the law. Ideally, the student and family will research these issues before the student goes off to college. Here is more information for you and your daughter to read. This letter about Legal Rights and Responsibilities is addressed to parents. Letter to Parents from the U.S. Department of Education, Office for Civil Rights (OCR) about changes students with disabilities encounter as they make the transition from high school to postsecondary education. Postsecondary institutions have significantly different responsibilities from those of school districts. This letter provides examples of the unique relationship between postsecondary institutions and students with disabilities. 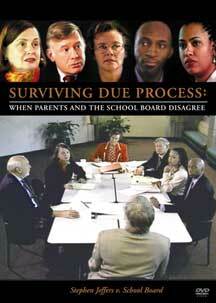 It seems that you are taking the lead in dealing with the school about accommodations for your college-age daughter. Colleges assume that the student, not the parent, will be advocating for their needs. The student usually discusses the accommodations she needs with her professors. If you are the primary advocate for your daughter, this may account for some of the resistance you have experienced. Your daughter needs to contact the disability support office at the college. 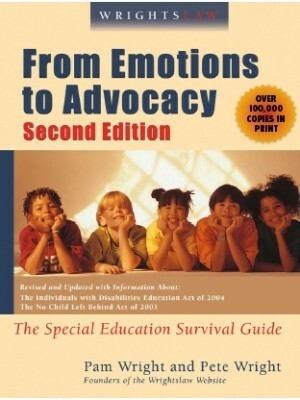 In most cases, the people who work in disability support offices are knowledgeable about the issues, and can help students create a strategy to deal with any issues. 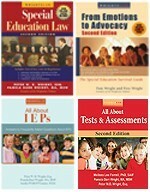 These two articles are for students with disabilities. Students with Disabilities Preparing for Postsecondary Education: Know Your Rights and Responsibilities. 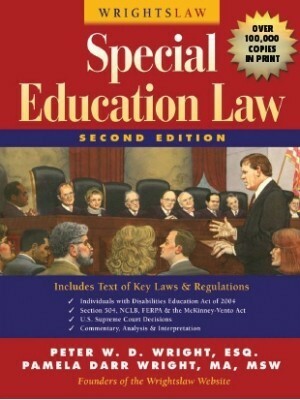 The Office for Civil Rights (OCR) in the U.S. Department of Education is providing the information in this pamphlet to explain the rights and responsibilities of students with disabilities who are preparing to attend postsecondary schools. This pamphlet also explains the obligations of a postsecondary school to provide academic adjustments, including auxiliary aids and services, to ensure that the school does not discriminate on the basis of disability. 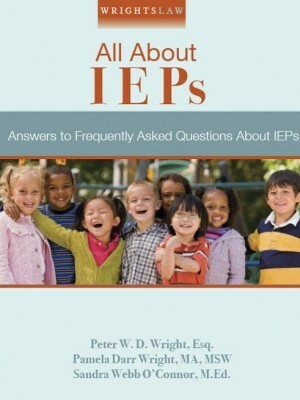 ADA Q & A: Section 504 & Postsecondary Education – Many parents of students with disabilities know about rights and responsibilities under the Individuals with Disabilities Education Act (IDEA). As students and their families prepare for the transition from high school to postsecondary options, they will often find they are less familiar with protections provided by the Americans with Disabilities Act (ADA) and Section 504 of the Rehabilitation Act. This article will answer many of these questions. 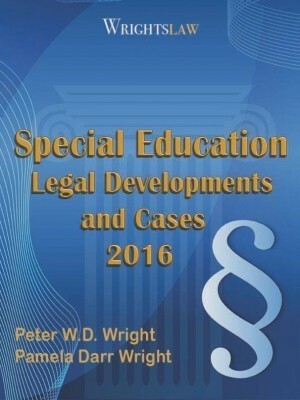 This entry was posted in College & Continuing Education and tagged ADA, College Accommodations, College and Continuing Education, Section 504, Self Advocacy by Wrightslaw. Bookmark the permalink. I have a daughter graduating this year from high school. She has multiple areas of difficulty. I use the term difficulties rather then disabilities because these children learned differently. I think difficulty is a more appropriate word rather than disabilities. I have a 29 year old who had the same difficulties as my 17 year old. He has successfully gone and only has a few more classes in order to graduate. The school district told me he would never be anything. That was the wrong thing to say to me. My son is doing great in life. I became an educational advocate. Now I am heading to law school to continue to ensure other children receive an appropriate education.